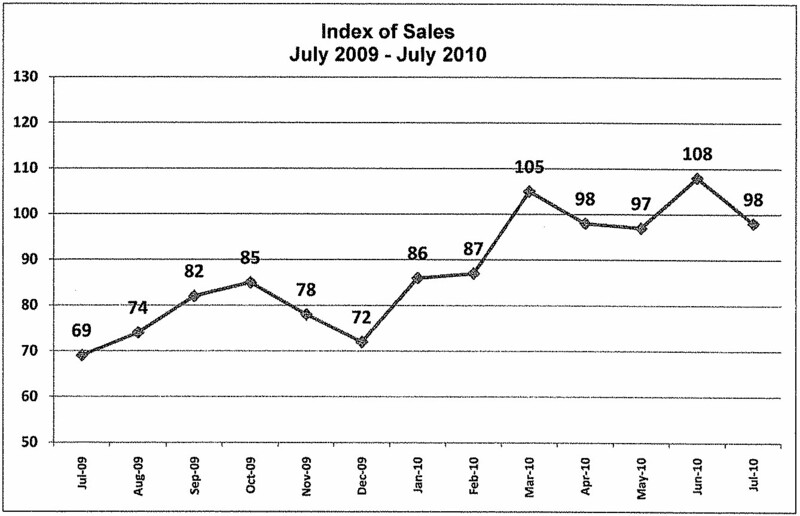 Sales index down 10 points outlook for next 3 months positive. The three month outlook for sales, lead time, employment and profitability are all quite positive as our industry passes the fourteenth month above the May 2009 low. We are encouraged that our index did not drop further in July, a seasonally weak month for our industry. Average length of first shift is up to 43.1 hours, more than 5 hours above the 2009 average. 94 percent of participating shops expect profitablity to remain the same or improve. Those expecting sales to remain the same or increase made up 90% of our respondents. How about you? Are you busier than heck? Are you still in the range we are calling the New Normal? This entry was posted on Wednesday, August 25th, 2010 at 4:04 am and is filed under Front Office. You can follow any responses to this entry through the RSS 2.0 feed. You can leave a response, or trackback from your own site.